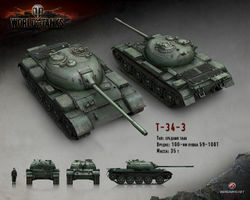 The T-34-3 is a Chinese tier 8 premium medium tank. 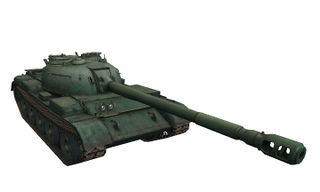 The T-34-3 medium tank was to be a modification of the T-34-2. The design was developed in 1957. 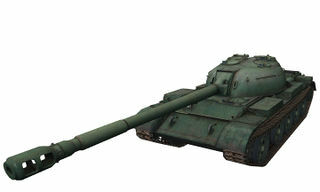 However, mass production of the Type 59 was started in 1958, and the T-34-3 project was discontinued. 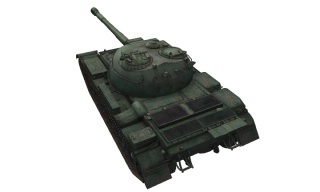 The T-34-3 has high alpha and gives this tank very good damage potential. Penetration is poor so use the mobility to flank and get to sides of heavy tanks. Unfortunately accuracy of the Chinese gun is even lower than similar Soviet guns. Turret armor is strong like similar tanks. One of the best ways to play this tank is to find a shell hole or depression in the ground and sit it in while only exposing your turret armor and watching the other teams shots just bounce. (Just remember to move before arty gets you). If you can't find a hole to hide in, play carefully as your hull armor while good, it won't save you in a brawl with other tanks. If you do find yourself in a brawl, try to keep your very thin side armor covered so they have to shoot your turret. Also try not to get flanked as while you have decent mobility, other tanks have better and can circle you to death by shooting you weak side armor. With your low pen with basic ammo, try to hit weak spots or shoot tanks in the side. If you try to circle them, don't get tracked or you will die fast as your reload is slow compared to other tanks. 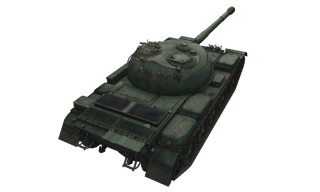 Facehugging can be a viable tactic while using this tank, especially against opponents with bad gun depression. Because of its long reload, having a shell rammer is a must for this tank. Other than that it's advisable to try to improve your aim time and equip a Vertical Stabilizer and Enhanced Gun Laying Drive. Also should be noted that this tank has very good camouflage values. Training crew with camo skills can keep the tank hidden until its gun is fired. Training Brothers in Arms for all crew gives extra 5% crew skill which helps slightly with aiming time, accuracy and reload. 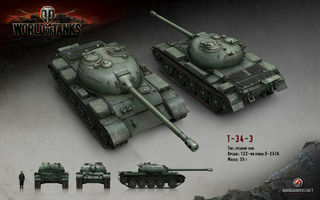 The T-34-3 was a different version of the T-34-2 project which aimed to create T-54-esque tanks at a time when China only had IS-2s and a T-34s. It came very close to looking like a T-54 and had a 122mm gun, modified and taken from an IS-2 heavy tank. The project never saw service. This page was last modified on 26 October 2018, at 16:54. This page has been accessed 255,543 times.